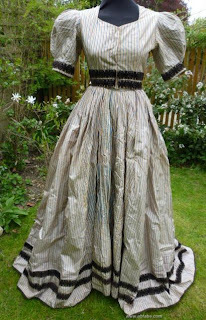 A well made elegant well constructed collectable mid Victorian striped silk full skirted dress with short puffed sleeves, black cut velvet ribbon trim. The dress is made from very good quality medium weight silk, the silk has a lovely sheen and rustles nicely. 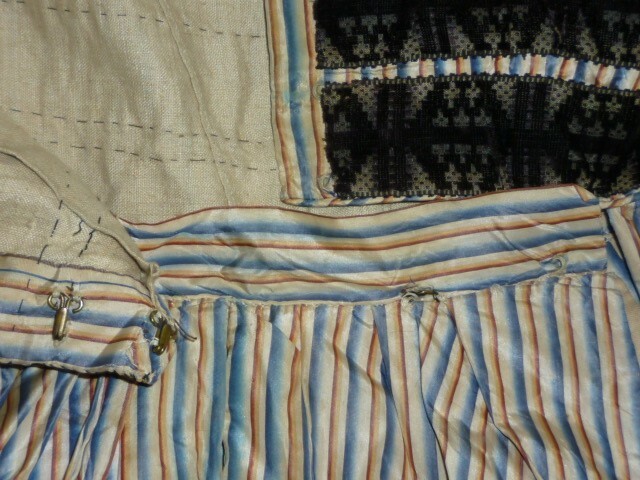 The stripe colours are dark red (the only stripe with a hard edge), shaded ochre, shaded mid blue & cream. The bodice is piped at the neck and sleeve cuff, it is fully lined in cream cotton, the skirt in a lighter weight different glazed cotton. 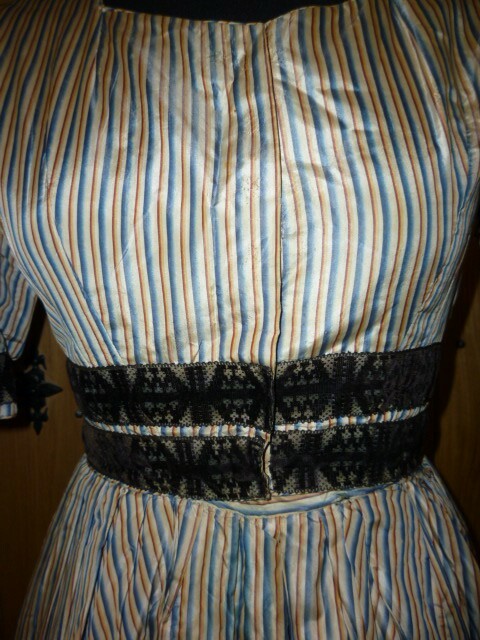 There are seven hooks & loops to close the bodice at centre front. 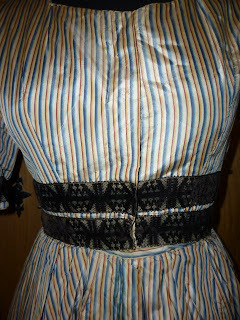 The skirt closes slightly to the left and fastens on the waist band with hooks and loops.There is a hidden pocket in the right side and a tiny coin pocket at waist level. 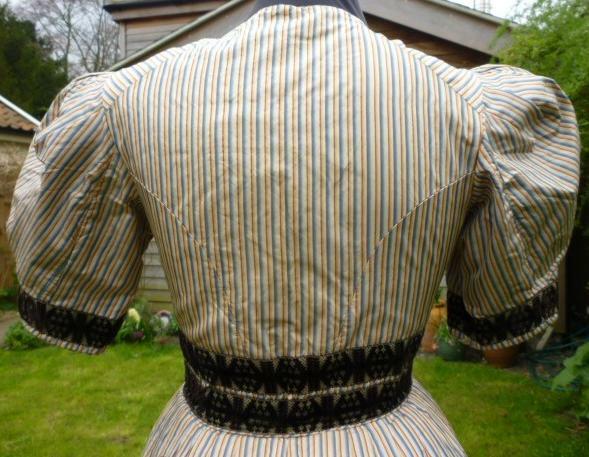 In my opinion the dress is early 19c, narrow width 19 inch wide silk has been used to make the dress, all sewn by hand, later alterations are machine sewn. 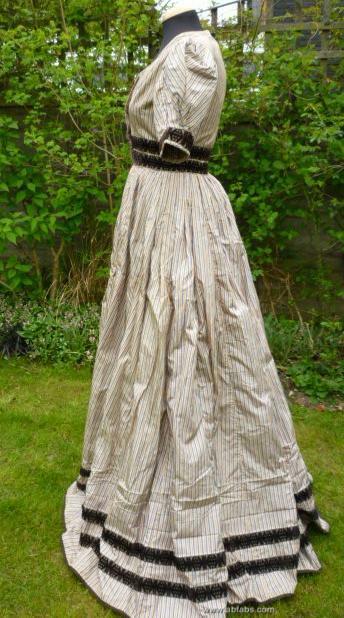 Not a reproduction this is a genuine antique dress so there are a few faults/issues. 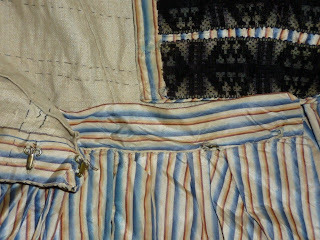 The dress has been altered at some time over the decades ie the trim has been added later. There is very slight general fade to the silk and underarm stains which look worse in the pics than they actually are. 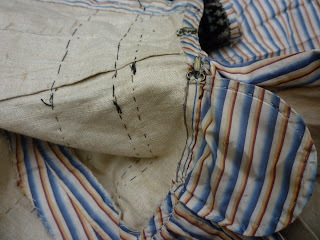 There are a few small holes close to the hem of the skirt, mainly on the binding. 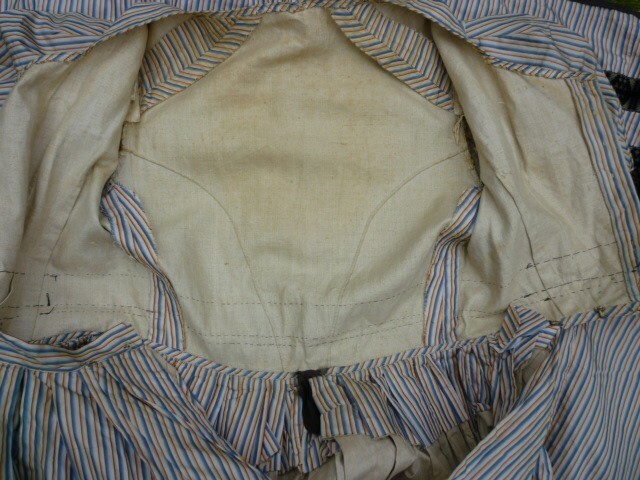 By far the worse is an area on the right side of the front of the skirt which is brighter than the rest see pic 15, most of this is hidden in the folds pic 16. All mentioned is shown so please take a close look at the photos. Click on any image to enlarge. 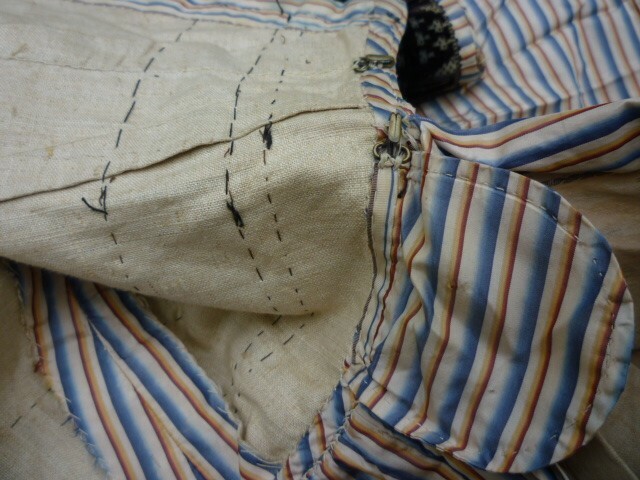 Overall though, no moth attack, rips, tears or rot in the fabric. The body/fabric and trim of this lovely period dress are in good substantial condition, wearable if it fits. Measures :34" bust, 15 1/2" long front, 15 1/2" long back, 6" sleeve length from underarm, 10" sleeve opening. 26" waist. The dress is 56 1/2" long at centre front, 61 3/4" long at centre back, 224" hem circumference. The sleeves are a dead give away. This is from the Gay 90's. BTW, you can still buy narrow silk pretty easily. It's from Japan.